Autumn may be flowing in, thank goodness, but I’m not above having a nice salad. Even though it wasn’t intended. How would a salad happen accidentally? It’s easy when you are having a flighty moment. I definitely knew I wanted to do grilled skirt steak with a tomatillo sauce. I was thinking a rustic type of sauce to act as the veg portion of the dinner. That didn’t work out as you will see. We didn’t have much luck with growing tomatillos the past few years so we didn’t attempt it this year but luckily the farmer’s market had some. Our garden has produced a bumper crop of hot peppers. I just wish tomatillos weren’t so sticky once you peel the papery covering off. Cut the tomatillos in half and keep the pepper whole. Fire up the grill and roast the tomatillos and pepper until they start to char. You don’t want charcoal veg as a result so keep an eye on this as it will cook quickly. As I said my plan was to have a rustic meal but I realised a grilled potato and a bit of steak wouldn’t cut it. When I did up the sauce it became more of a dressing rather than a veg side. So salad it was! Using a food processor add the tomatillos and pepper. I kept the seeds to give it a kick. Throw in a couple of cloves of garlic, a teaspoon or so of cilantro, and a few splashes of lime juice and olive oil. Blend. I kept the steak simple seasoned with sea salt, pepper, and worcestershire sauce. Because it is grass fed be careful on how hot you cook it. Sear then lower the heat. Keeps it tender. Slice the steak and top with the tomatillo sauce. Any leftover sauce can be frozen for later. I’ve been trying this week to figure out video editing and the open source software. No success yet. I’m trying not to get frustrated but it drives me batty when my love of technology runs into the wall of not knowing how to make it work for me. So it may be awhile before I get this up and running. Annoying since I have a few ideas and I can see it in my head. Just need to get it through the keyboard onto the screen. Peaches are in season and they have been showing up at the co-op, yay! And they had pork on sale. I know, I know, meat on sale? Can’t be a good idea. Usually I would agree but I’ve had success with the sales at the co-op. In a small bowl mix up a dry rub. I used a tablespoon of brown sugar, 1 1/2 teaspoons of cayenne pepper, 1/2 – 3/4 teaspoon of ground cumin and dried cilantro, and sea salt and pepper. Mix well and rub on both sides of the pork. Set aside to “marinade”. For the peach bourbon sauce chop up an onion to make about 1/2 a cup and finely chop 3-4 cloves of garlic. Heat up a couple of tablespoons of olive oil in a skillet and start cooking the onion and garlic. Peel and dice one peach. Add to the skillet. Simmer until the peach starts to soften. Add 2-3 tablespoons of bourbon. I used Gentleman Jack but use whatever one you enjoy. Then add brown sugar. I started with a tablespoon but added more as it cooked to balance it with the bourbon. I also seasoned it with a teaspoon of cayenne, sea salt, and pepper. Continue to simmer until the peaches soften and the sauce reduces a bit. Grill the pork and a peach cut in half. I could do without the stifling heat of summer but boy do I love the flavours. There is a new Indian restaurant here in town. We did make the mistake going on opening night. We were getting cranky waiting for the food! But once the food did arrive it was really good. So I hope that they get things sorted because we would love to have a proper Indian restaurant in town. I had ordered a spicy lamb curry with tomato, garlic and onion. 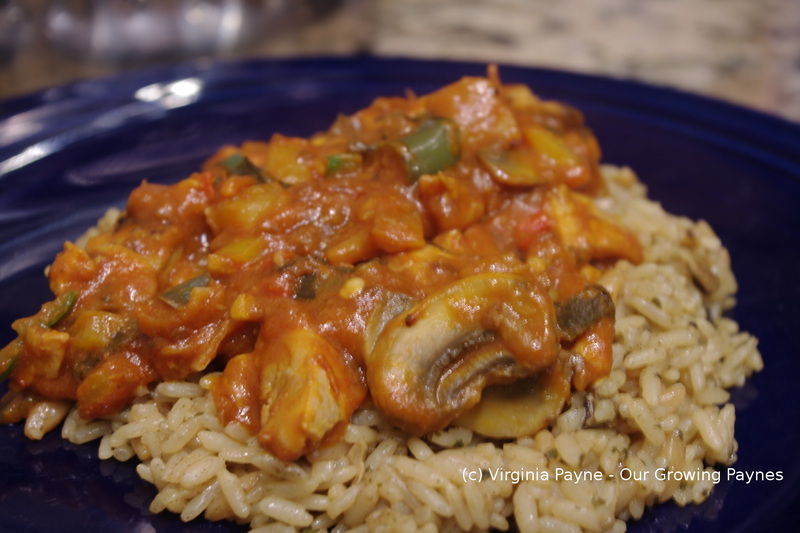 A slow cooked flavourful curry with a great balance of heat. I had to recreate it. I planned on doing that for my dad’s birthday but since plans got changed (for a good reason!) I decided to make it for the kids when they got back from FL as they both requested curry for dinner. And they gave a thumbs up for adding spice. This is a dish you want to slow cook, no short cuts on this on! But other than the time it takes it is really simple. Heat up a couple of tablespoons of olive oil in a skillet. Season about a pound of stewing beef or lamb with sea salt and pepper. Brown the meat on all sides. Coarsely chop an onion and 3-4 cloves of garlic. Add to the skillet. We have been growing Ring O Fire peppers in our garden so I harvested a couple for this. Start off with one pepper. It’s a lot easier to add more heat than remove it. Again, seeds increase the heat so use your judgement. Saute for a few minutes to soften the onion then add a 14 oz can of crushed tomatoes. Bring to a simmer. Freshly grate about 1 – 2 inch/2.5-5cm piece of ginger, add to the skillet. Chop a small handful of fresh cilantro. 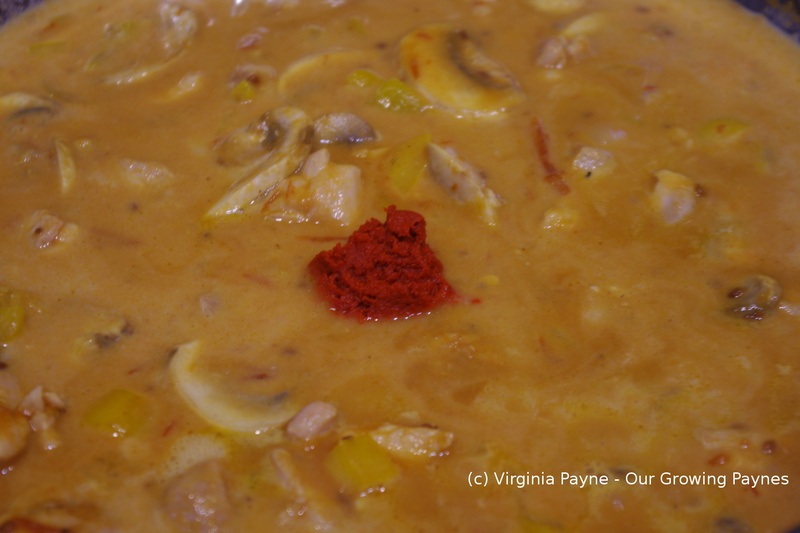 Then season with sea salt and pepper, 1-2 teaspoons of garam masala, and a couple of tablespoons of red curry paste. Cover and keep it on a low simmer for a few hours. Stir occasionally so it doesn’t catch on the bottom. Half way through cooking test the heat and if you want more add more hot pepper. Adjust for the curry seasoning with the paste if needed as well. Meanwhile, my husband made up some incredible naan for us to enjoy. We thought the naan would be enough so I didn’t do up any rice. I was really pleased with this, it tasted close to what I had at the restaurant. It was hearty without being heavy. Today is the first day of school for the kids. Our daughter started high school and our son is starting middle school. Wondering where time is going. But to make it a fun day I’m making pavlova and and chicken cordon bleu. Can’t wait to hear all the stories! It was a very long week last week but everything went well with my dad’s surgery. Yesterday they discharged him from hospital and now he is recuperating at home. We were all breathing a sigh of relief. Still are if you want to know the truth. So he’ll be causing trouble for a good long while now and we wouldn’t have it any other way! As you can imagine I’m a bit backed up with blog posts and getting everything else back on track. Kids are back at school this week so we’re winding down the summer the next couple of days. Making sure they get back into the routine of things. Last weekend I was in the mood for Thai flavours and decided to do a grilled steak with rice noodles. We have had some success with growing fresh garlic this year and we also had ginger and cilantro on hand. In a bowl mix 2 tablespoons peanut oil, 2 tablespoons oyster sauce, 2 tablespoons amino acid, 1 tablespoon lime juice, one to two teaspoons of fresh chopped cilantro, a large clove of garlic, finely chopped, and salt and pepper. Add the steak to marinate for at least an hour. When it is time to cook, heat up a couple of tablespoons of peanut oil. Add a few cloves of garlic, finely chopped, and a couple of scallions, chopped. Saute until the garlic starts to soften. Add a cayenne pepper. When slicing use gloves, saves on burning skin. We keep the seeds but some may find that too hot. Saute for a few minutes. Add a cup of chicken stock and bring to a simmer. I made the mistake of adding the rest of the veg too soon. I like my veg on the crispy side. 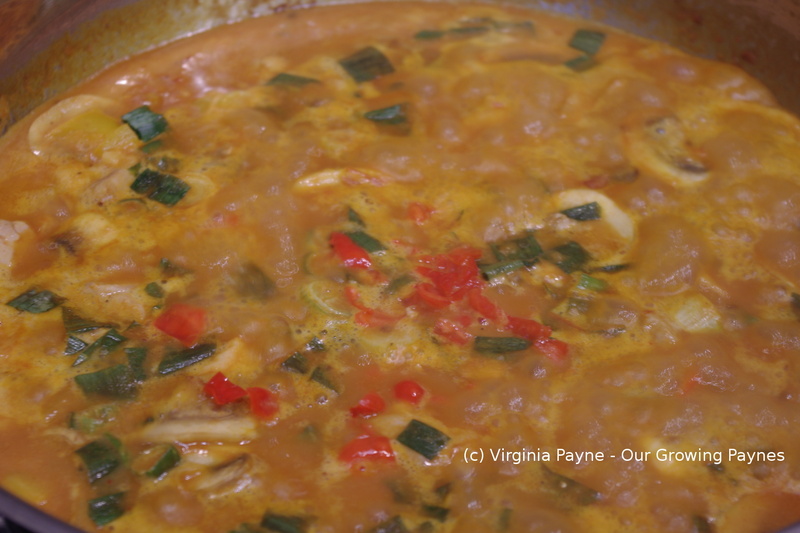 If you like them soft then add the peppers and mushrooms when you add the stock. Also add carrots. I added a couple of tablespoons of green curry paste, a tablespoon of oyster sauce, a tablespoon of amino acids, and a splash of lime juice. Continue to simmer. As it cooks adjust the flavour to your liking. Grill the steak to medium rare. Take the leftover marinade and add it to the skillet and continue to simmer. While the steak is resting add half a cup light coconut milk. Add a few more teaspoons of freshly chopped cilantro at this stage as well. While this is being created cook rice noodles according to the package. Toss the noodles in the sauce and serve. Top with the steak and peanuts. I enjoyed this dish. 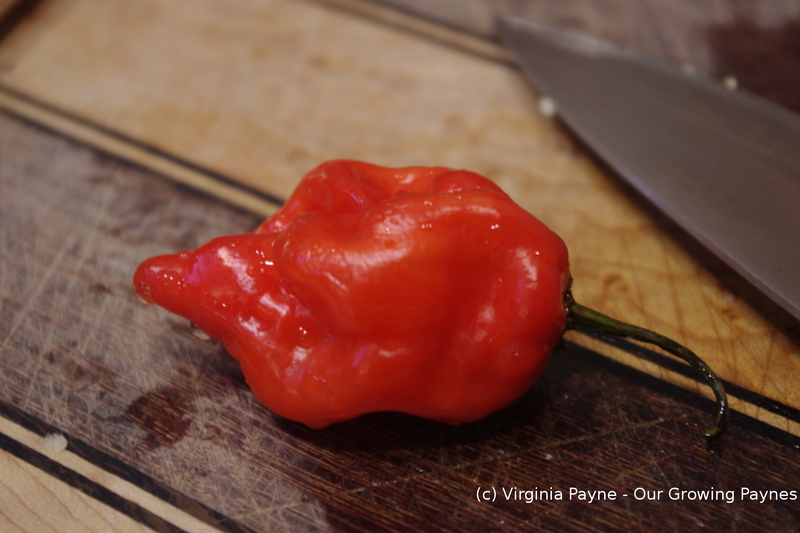 The heat was mild but you could always add more hot pepper as you cook. Tonight we are doing Pad Thai for dinner. Another one of our favourites! It’s been quite the week with the kids and the end of year celebrations. Even though I’m not a fan of so called graduations at a level below the end of high school I still enjoy cheering them on. Our son had his 5th grade recognition and received the President’s Award for Academic Improvement. Each child had to do a mini speech about their favourite memory from school. They did really well. It’s not easy speaking in front of a crowd. And the poor kid was struggling through a cold from hell. Our daughter had her 8th grade recognition yesterday. Somehow she managed to go four years straight without missing a day of school. I have no idea what that is like. I was always sick growing up. She also achieved high honours 11 out of the 12 quarters. We are so proud of our kids and what they have achieved so far. It’s quite something to see how they are doing on their journey. We had a chilly day a week ago and my son requested pasta so comfort food was on deck. A local farm had some lovely jalapeno sausages. Good ones too, not like the mealy ones we kept getting at the co-op. So I’ll have to buy them as she has them! Because of the jalapeno I wanted to go with Mexican flavours to highlight the heat. Begin by browning the sausages in the skillet with a bit of olive oil. Brown all the sides but don’t worry about cooking all the way through. They’ll be finished off in the dish. Set aside and add a few cloves of garlic, chopped, and a few mushrooms, sliced. Saute until the garlic is softened. Then add chopped peppers and scallions. Cook for a minute or so then add a chopped tomato. Add a cup of homemade stock and bring to a simmer. Slice the sausages and add to the mixture. Next add a tablespoon of lime juice, a tablespoon of chili powder, a couple of teaspoons of cumin, and salt and pepper to season. Chop up some fresh cilantro and stir in at the end. Once the sausage is cooked through add the pasta and toss well. It is strange coming into the last bit of the school year. Both kids are finishing up at each of their schools and getting ready to move up to the next school. Which means a flurry of celebrations and year end events. A lot of lasts. My son’s school has a cookout for the whole school with activities outside. They finish off with a water balloon toss with the oldest students and the teachers. They absolutely love that bit! A big change from when I was a kid though would be the new tradition of having a graduation for every level of school including preschool! At least our son’s celebration is called a recognition instead of graduation. It’s a bit much. Don’t get me wrong, I’m insanely proud of our kids. I love watching them grow and becoming fabulous people. They are really coming into their own. The other day I planned on grilling pork in an Asian marinade to put over salad. Great plan until I realised we had run out of gas for the grill. Plan B was grilling on the stove top. Marinate the pork for at least an hour. Also, take some of the marinade and marinate a few mushrooms. If you are lucky enough to have a working grill on hand, grill away until the pork is cooked. Otherwise continue with plan b. While the pork is resting grill the mushrooms. Slice the pork and mushrooms and top your salad with them. For a dressing I quickly mixed up a bit of peanut oil, rice vinegar, and lime juice. A great light meal for the hotter weather. And we’ve since rectified the gas situation so no more plan b for the time being! My lovely husband bought me “The Complete Asian Cookbook – Thailand, Vietnam, Cambodia, Laos & Burma” by Charmaine Solomon. There are some amazing recipes in this book but the tricky bit is finding ingredients for some of them. I have absolutely no idea where to find galangal, couldn’t find tamarind in any store, but I won’t be deterred! No sir. That’s what the internet is for. In the meantime I’ll either adjust where I can or use the recipes in the book that have easy to find ingredients. And we can get garlic so that was our first choice to try. I’ve bookmarked several I can’t wait to try but this is our starting point. It is called Kai Yang or Garlic Chicken. In a bowl large enough to hold the chicken add 6 cloves of garlic, finely minced, 2 teaspoons of sea salt, 1 to 1 1/2 tablespoons of coarsely ground black pepper, 3/4 cup finely chopped fresh cilantro, 1 1/2 tablespoon of lemon juice, and a teaspoon of chilli powder. Mix well. I chose to use chicken thighs, bone in, for this dish. Add the chicken to the bowl and make sure the chicken is coated with the garlic mixture. Cover and place in the fridge for at least an hour. When it is time to cook the meal preheat the oven to 400F/200C. The book said to serve with rice and fresh tomato sprinkled with chilli powder. I wasn’t in the mood for rice so I prepped sweet potato seasoned with the chilli powder and roasted it. I also thought bok choi would be a great base to the chicken. When the oven is ready roast the chicken, turning it every 5-10 minutes until it is cooked. Take the rest of the garlic mixture that was left in the bowl and heat it up in a skillet with some olive oil. Saute the bok choi as you take out the chicken. You don’t want to cook the bok choi too much. Slice a fresh tomato and season with chilli powder and a bit of sea salt. This was a new idea for me and I love it. I’ll be having fresh tomatoes out of the garden this summer with this. Fabulous! We’ve been experiencing what would be in normal times unbelievable frigid temps. But it is positively balmy compared to the Midwest. It’s mind blowing the temps they are experiencing. Walking our dogs in all our winter gear trying to stay warm and watching the dogs get what we call flat tyres with their paws lifted off the ground left me wondering what we would do if that type of cold made it to us. You can’t not walk the dogs. I’m thinking we should be looking into getting coats for them but what are the chances? I would have thought zero until this past week and the polar vortex. I was actually wondering last night what we had for old winter coats that could be used in case the cold hits us. I think the dogs would fight us on that one! I can just imagine trying to zip them up. Because it’s cold and I still have that cold going round I thought I would make a spicy dish for my husband. A knock your socks off, make Texas stand up and take notice, evict the cold dish. That was the plan. I thought it was spicy while my husband thought it had a lovely mild heat. I put a habanero and two serranos in the dish! Before I begin the recipe please excuse the photos. Something is going on with my camera and I have to figure it out. Suddenly in the kitchen the camera has slowed down on the shutter speed. When I do it manually the pictures come out dark as can be. Plus it keeps thinking there is a memory card error or it thinks the card is full. It works fine in natural light as I tested it this morning. The lights in the kitchen overhead are now all fluorescent instead of a mix, could that be an issue? Any advice would be greatly appreciated. 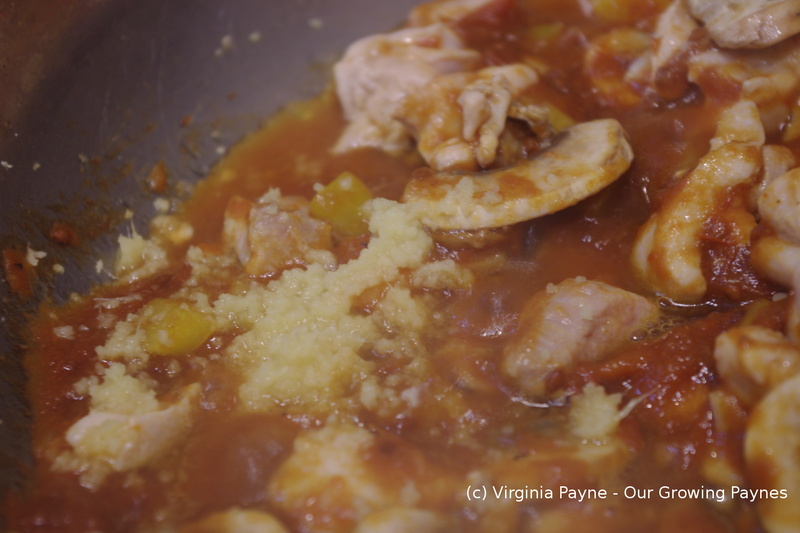 In a skillet brown some chicken and when they are nearly cooked add sweet pepper and garlic. To that add about a cup of plain tomato sauce and grated ginger (about an inch square though you can add more). Simmer for a couple of minutes then add about 7 or 8 oz of coconut milk, a bit of lime juice, cilantro, and a couple of spoonfuls of red thai curry paste. While this is simmering I diced up a habanero pepper and two serranos. I use gloves to do this as the pepper oil sticks on me for days and it burns. Add the peppers to the dish a long with a good handful of chopped scallions. I let the mixture reduce a bit to concentrate the flavours. I did add more of the curry paste to kick it up a bit. Serve over rice of your choice. This would have knocked the kids back. I felt the heat. And my husband enjoyed it. 🙂 The beauty of this dish is you can make it as hot as you would like. I wonder how many peppers I would have to add for my husband to go Whoa!